Yesterday we went out since afternoon and only got home slightly after 5pm. Initially I wanted to pack dinner from the nearby food court but I thought of the half pot of 6 flavour soup or 六味汤 and decided to just stir-fry a veggie to have together with the soup, a simple dinner for 3 of us. Well, things did not actually turned out and we ended wtih 3+1 dishes instead; leftover herbal soup, Shanghai green with ham, soy sauce braised salmon fillets & chai por egg or preserved turnip omelette. 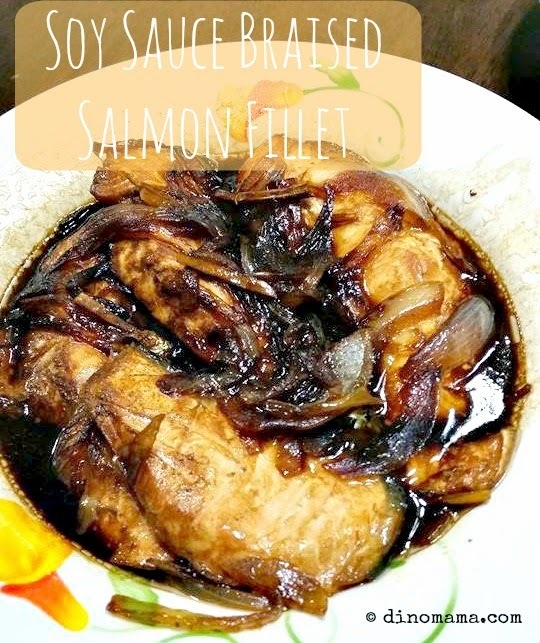 Today I am sharing with you the soy sauce braised salmon fillet that can be done in under 30mins. Ok, this probably is not the best food photo but I was so famished that I just snapped ONE photo before attacking my dinner. It may not look appetizing but trust me, its delicious with the sweetness from the onions and the fish oil from the salmon. This brand of light soy sauce I am using is unusually dark, I had to look twice to ensure that it is not dark soy sauce. So, your dish may be lighter in color than mine but taste should nonetheless be the same. 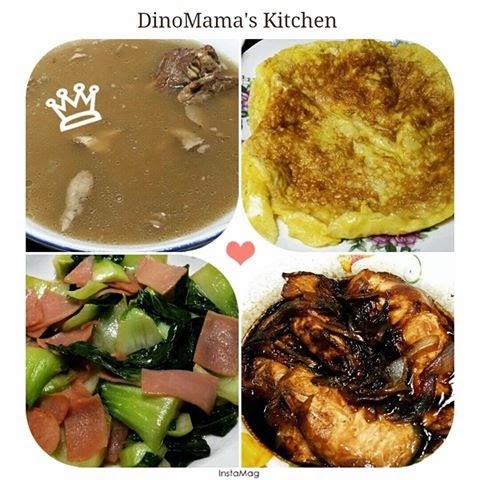 30mins is all you need to prepare this dish which you can have it alone with steaming white rice. A great fast to prepare dish on a weekday. Try it and let me know if you like it as much as we do. * 1 large onions, slice. 1. Heat up wok, add in the cooking oil. Once oil is heated add ginger, onion and scallions, fry for about 5 mins. 2. Once the 3 ingredients gives off some fragrance lay the salmon fillets on top. 3. Mix the rice wine and pour into the wok. 4. Add in the soy sauce by dribbling it over the fillets. 5. Cover the wok and turn down heat to medium-high. 6. Let it simmer for about 5 minutes. Turn down the heat to medium, remove the cover. The sauce should have thicken a bit. 7. The bottom of the salmon fillets should be light brown, this means that the soy flavour has already been absorbed by the fish. 8. Flip the fillets over to the other side and let it simmer with wok covered for another 2-3 mins.